In this week’s episode of Mad Genius Tips, F&W’s Justin Chapple demonstrates chef Richard Blais’s brilliant way to make crunchy cheese crisps in the microwave using leftover Parmesan rind. Here, more ways to use up leftover cheese scraps and rinds. In this week’s episode of Mad Genius Tips, F&W’s Justin Chapple demonstrates chef Richard Blais’s brilliant way to make crunchy cheese crisps in the microwave using leftover Parmesan rind. It’s quick, it’s easy and it’s a supersmart no-waste snack. Here, more ways to use up leftover cheese scraps and rinds. 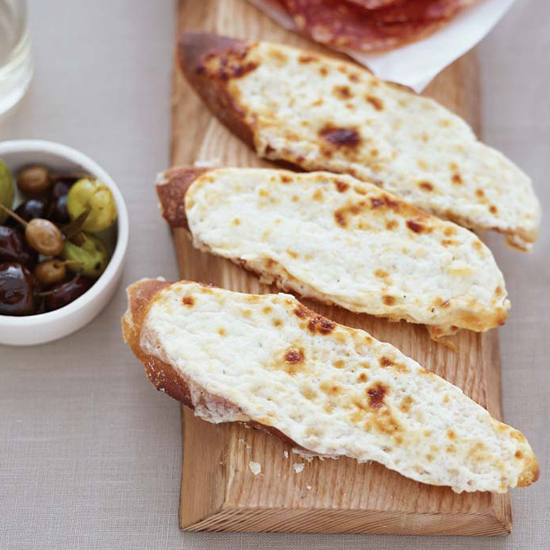 Fromage fort is the ultimate way of using leftover cheese. Jacques Pépin's father used to combine pieces of Camembert, Brie, Swiss, blue cheese and goat cheese together with his mother's leek broth, some white wine and crushed garlic. These ingredients marinated for a week to a week-and-a-half. Now Pépin's wife, Gloria, makes a milder version in a food processor that takes only seconds. Simmering Parmigiano-Reggiano rinds in the broth gives it a rich, cheesy flavor. It’s a great example of the “nothing wasted” approach that Italians take to their cooking. At the end of their wine-and-cheese parties, cheese-whizzes Helen Jane Hearn and Natalie Wassum gather any leftovers to make an incredible mac and cheese later in the week. Chef Sarah Grueneberg created this vegetarian version of Bolognese. It’s as rich and delicious as the meat version, in part thanks to the Parmigiano-Reggiano rind, which infuses the mushroom sauce with even more umami. This is a very forgiving recipe. You can make it with almost any cheese except highly processed ones. This is a poor man's dish in Emilia-Romagna, with delicious dumplings made from bread, eggs and cheese in a cheese rind–enriched meat broth—home cooking at its best. For extra richness, this boneless pork roast is simmered in a mix of buttermilk, garlic, sage and cheese rinds.